Ivo Andrić (1892 –1975) was a novelist, short story writer, and the winner of the Nobel Prize in Literature (1961). 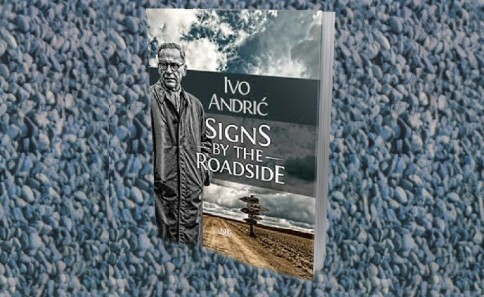 The collection of notes entitled "Znakovi pored puta"/ "Signs by the roadside", published after Andrić’s death, can be best described as the writer's intellectual diaries. As may be imagined of a man who recoiled so consistently from any exposure of his private life and thoughts, Andrić was equally consistent in his dislike of the diary as a genre, seeing it as a misguided search for permanence. THERE is nothing I am so concerned with as - words, and yet there is nothing about which I think less and more rarely. I am always with them, surrounded by them like a beekeeper by his bees, yet I unconsciously feel that it would be a waste of time, even harmful if I thought often about them. And when I sometimes, nevertheless, give free rein to my thoughts about the sound, shape and origin of words - not about those I use to say something definite, but about those simple, separate words „as such“, with their bare, lasting, transitional or transitory meaning - then these thoughts take me far away, through some dark woods and thirsty deserts. I am quite carried away and lose myself in trying to find out the sense and origin of words, I see all sorts of wonders there, but I always return from that kind of hunt exhausted, empty-handed, with a heavy head. Afterwards, I need a certain time and effort to establish the right relationship with those disturbed, scattered about words and to make out of them what I should like to say and what none of us is ever likely to say even approximately. BEFORE falling asleep. The book slips out of my hands, the letters intertwine and mingle, melt away, Spread and transform themselves into dark and silvery tears rolling down the page. Words lose their meaning, or, rather, alter their meaning, because suddenly they do not mean what they meant a little while ago: they acquire a new, unexpected and vague meaning instead. The passage which melted before my eyes was about the Middle Ages, and now it is as if I were reading about ancient Rome and even quite precisely about agrarian disturbances of the 2nd century B. C.
But I realise that even this is not essential, or the most important thing one ought to know and think about. There is something else, far deeper and more important, which disturbs my thoughts as I read, and would not let me go to sleep. Before Rome and before any written word, before recorded history, something fatal for human destiny took place, some great misfortune, some very serious misunderstanding with endless consequences. All that has come into the light of day now and has to be straightened out and cleared up in order that responsibilities should be established and wrongs put right. Words to explain and clear up all that ought to be found. And this ought to be done as soon as possible, for I shall not be able to sleep soundly or read anything quietly unless that be settled. This is my concern, my job and I am tired, weak, capable only of suffering on account of that vague and troubling thought which lies like a load on my breast. I muster my energies to reach and turn out the light, although I know, that I shall feel neither different nor better in that darkness. WHEN it is a question of words, it is difficult to say all that may befall a man with them. This usually happens at night, when I cannot go to sleep, or in those half awake hours when I am no longer awake, but not yet asleep, or in moments of slow awakening, when we extricate ourselves painfully from an involved dream as though crawling out of tepid, lethal marshes. Then words swarm to inhabit my consciousness, they open in it their masked ball and perform their dance, beginning with rigid minuets and ghostly quadrilles up to vulgar, impudent grimacing, mad prancing and noisy carousals. They mask and unmask themselves, pretending to be what they are not, they play with me, ridiculing me, as I normally play with them, till in the end I do not know what is what or who is who, as though all that which in the world was known as measure and reason, order and rule, had disappeared completely, as though madness (but a kind of planned and malevolent madness!) had become the general rule. Then, late in the night, I wake up from that nightmare with a start. I put the light on. Gasping for breath, I feel with my benumbed fingers the hard wall and the soft bed, looking for a road by which to return to my world. I collect my wits and come to slowly, surprised that all the things in the room should occupy their usual place and that everything should not be upturned and skattered. Slowly and carefully I look for words which, one by one, return to their old, established meanings and appear at the edge of my field of vision. Some of those nightmare words do not appear at all as though they were lost forever, in their own meaning. But I know that even those will return, whole and unchipped, in their old forms, with their true mennings. Of course this does not mean that they will not use the first opportunity to leap over back to another night carnival, like an outlaw going to the mountain. AFTER a certain time similar, short but heavy muddle and confusion ensue. After a well slept night - an uneasy dawn and awakening. Little by little, as though dawn were coming, the knowledge that no word has any longer the recognized, dear and „eternal“ sense which it used to have begins to take hold of me; it looks as though everything had suddenly betrayed, upturned and deformed everything else during my sleep, as though I could not rely on anything any longer, as though I could take nothing for granted and certain, not even believe myself as, quite rightly, nobody believes anyone any longer. If only words had vanished completely! But no - they are all there, set in long rows, as in a dictionary, and each one of them still has its meaning, but it is so arbitrary now, so capricious and altered that you cannot have the slightest inkling of it. Those words do not even mean the opposite of what they used to mean, because that would still be some kind of system and direction whereas this is absolute chaos and agony. Darkness and slippery ground under me. I am losing myself. There is nothing to catch hold of, and yet I have to continue as in the best times when one walked along a safe road in bright daylight. AND a real miracle happened last night. Words began to transform themselves, one by one, into people, animals and objects around me, each becoming the thing it only suggested before. Until just a little while ago, quieter than shadows and more transitory than wind itself, they suddenly stopped, grew into bodies and acquired weight, circumference and all the other qualities of living beings and known objects. Then they dispersed in order into rooms around me. „The word became body.“ Yes, that is easy to say, it even sound good, but nobody can imagine what it looks like when this really happens. Suddenly, I became rich - rich in a way I never, not even in my wildest dreams could imagine or desire. I was submerged by riches. I ought to have everything, but in fact everything had me. A thousandth part of that would be enough to knock me down and bury me, to break and stop such a weak and short breath as mine. And new words were flying in all the time, falling around me and instantly turning into what they had just suggested before. When I thought that I had finally disappeared, another miracle took place, a new and even stranger one. In a flash all around me turned again, as though by magic, into words which - like a dance of noiseless sounds, lighter than the shadows of invisible birds flew away from me far into silence, into oblivion, non-existence, there where words go when they cease to be, when they lose their meaning and become obsolete. And I was left alone again, wondering who I was now, and what else would I have to be and mean in that endless game of words. How am I to survive? Around me absolute silence, neither day nor night, just a nameless emptiness.